Many young-earth creationists are becoming more and more likely to view the origin of horse species and other large groups of similar species as the result as descent from a common ancestor albeit via mechanisms and at rates which may not be recognizable to evolutionary biologists. But if speciation happens and common ancestry is common for the creationists where do they think variation in a kind ends and a new kind begins? No one disputes that Mr. Ed was a horse but what about the plains zebra, the quagga, or the donkey? Too bad they can’t just tell us. Are these all horses (equines)? What about the 15 extinct species, including the quagga, that taxonomists have assigned to the same genus, Equus, and taxonomists call equines? And what about the other 30 or more named fossil genera and at least 150 species contained in them that share many similarities with the living members of the genus Equus including horse, donkey and multiple species of zebra? Although similar these other genera and species they also have many significant differences from living equines. More to the point, when might we conclude that a horse is NOT a horse? Was an animal that was one foot tall at maturity and walked on feet with four toes a horse or should we call it something else? These are fundamental questions that taxonomists grapple with on a daily basis. Those questions include how we define species and how we understand their origins. Defining the limits of what make a horse a horse can be challenging to any biologist but it poses some special challenges to adherents of the 20th century American phenomena of young-earth creationism which holds to a 6000 year old earth and creation of living things within the span of six twenty-four hour days. In the past decade, more and more young-earth creationists (YECs) have embraced lumping large numbers of similar species together and proposed that all members of these groups are a single “kind” and therefore shared a single common ancestor in the past—in this case the very recent past when the kinds departed Noah’s Ark 4350 years ago. For example, A donkey, a zebra and a horse may appear to be distinct species today but with the creationist’ conception of a kind—sometimes called a baramin—they are all just variants on one created thing that we could call generically a horse. But we might ask, where does this horse “kind” end and another not-horse kind begin? Does this horse kind include all of these other fossil species, none of which are like any of today’s horses but neither are they radically different from them? A typical representation of the horse fossil record and evolutionary interpretation of that record. This is the type of figure that young earth creationists have been saying is wrong for many years but are not beginning to admit is not altogether incorrect. Click for original source of this file which is on blog that claims that this chart is a lie. The horse series shown in the figure to the right is similar to one that has been used to demonstrate how the fossil record can be interpreted as the history of evolutionary sequence of events that has resulted in our living horse species from a small dog-sized ancestor. The history is told through a progression of tooth and foot bone changes over 40-50 million years that resulted in the variation that we see today. For a long time creationist’s, particularly those of the young-earth variety, have, not surprisingly, claimed that this sequence of evolutionary changes from a small common ancestor was a lie. No such changes could occur but rather the fossil horses represented separately created species. These fossil species were believed to represent different kinds of animals that were caught up in a global flood and deposited in rocks and deferentially sorted by size from smaller to larger in upper layers. Over and over again the horse fossil series has been held up as an example of a fanciful speculation of evolutionists. For regular readers I may sound like I’m beating a dead horse. Yes, this is another story of how YECs have been gradually changing their public messaging with respect to speciation and common ancestry. What we will do here and in the next couple of posts is explore what YECs call the study of the origin of species which they call baraminology (see here for more: Thoughts on Baraminology). While creationists don’t use the term evolution and roundly deny that evolutionary theory has any validity, they have changed and adapted their use of terms such as micro and macroevolution to accommodate greater and greater amounts of evolutionary change to organisms over time. They have replaced discussion of the origin of species with the so-called Biblical concept of an origin of a kind or baramin. In their interpretation of scripture, a baramin allows for much greater genetic breadth than does the modern concept of a taxonomic species. In fact, so much genetic breadth is allowed within a baramin that hundreds of biological species may be encompassed by a single baramin. YECs often claim that this genetic breadth was the result of massive amounts of genetic variation built into the first created animals. The variation was then sorted into genetically distinct sets of organisms. However, I think a significant shift in the creationists’ landscape is happening right now as I see one creation scientist after another hinting that much of this genetic variation may actually come from new mutations even while claiming that “new” information/traits can’t evolve. In future posts I will provide quotes to back up my assertion that the landscape of creationist’ thinking has been changing and is becoming, dare I say, more evolutionary in its assumptions. Coming back to our question of when is a horse a horse, in my next post I will look at an intramural debate among YECs about the evolutionary horse series. That debate is about just how much of the evolutionary story can a YEC accommodate to explain the great diversity in kinds of animals. Look at the image to the right which shows some of the diversity of “horses” in the fossil record and present. Our question for young earth creationists going forward will be this: Did all these horse-like organisms evolve from a common ancestor and if so what did that ancestral pair on Noah’s Ark look like? Some young-earth organizations (e.g. Answers in Genesis) now openly suggest that it is true, all of these species evolved from just one species and even just one pair of animals. That animal was a dog-sized multi-toed animal which stepped off the ark and “evolved” into the horse species we see today. If this is true, the “horse series” that is presented in biology textbooks is not such a lie after all. As you can imagine not all creationists are able to swallow such a radical acceptance of speciation from common ancestors but they have had difficulty explaining the features of the fossil record to any satisfaction without resorting to at least some rapid evolutionary action. In our next post we will look more closely at what we mean by a “species” and how this term is critical to examining the young-earth claims about speciation and their view of the origins of biological diversity. 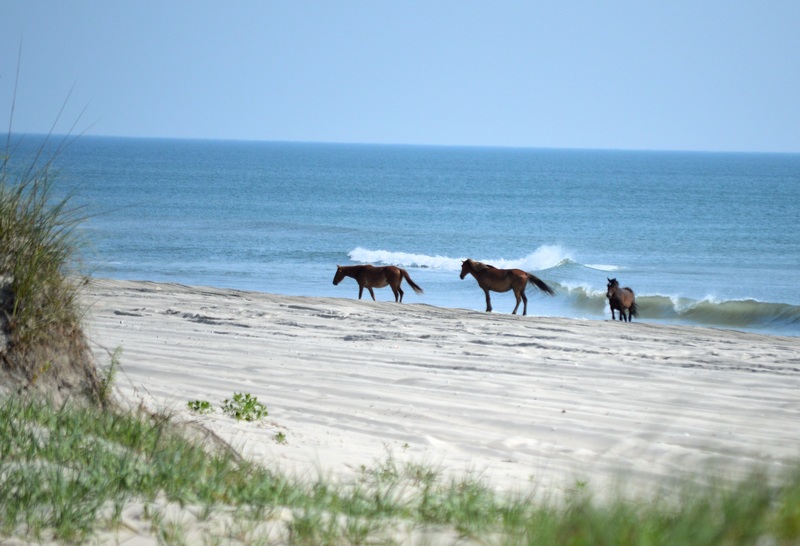 Cover photo: “Wild” Banker horses from the Outer Banks area of North Carolina. These horses were domesticated horses brought here from Europe that then escaped into the wild and have been living along these beaches for possibly as long as 400 years. Despite living wild all that time they differ only moderately in appearance and genetics from other domesticated horses. Photo: Joel Duff in 2014. In case you, or any of your readers, are interested, I wrote a paper a decade ago on the ‘Horse Series’ for an edited volume (ironically, and unfortunately on purpose, called ‘Icons of Evolution’), that not only provides a comprehensive overview of horse evolution, but also tackles many of the common creationist snipes, and considers the way that we view the evolution of sole-surviving taxa as ‘orthogenesis’ (by a consideration of the ‘evolution of the cow’). The only URL I have is to Academia.com, which may not work for most readers, but the paper can be found elsewhere online by a search on my name and ‘Horse Series’. Thanks for the suggestion. That is a really helpful article. I think the point is that an oscillating number of ribs in a proposed evolutionary sequence is not compatible with Occam’s Razor and seems to make the evolutionary sequence doubtful. The fact that evolutionists do not include rib numbers in their horse sequence charts is seen as hiding important information. The YECs never claimed that rib numbers formed part of the evolutionary argument; quite the contrary. The important information that is being hidden here is by the creationists, when they fail to inform their readers that the number of ribs and lumbar vertebrae is variable even among breeds of domestic horses. What is not variable is the number of toes and the morphology of the teeth. For the record, I’ve seen this rib argument many times, but not recently. Perhaps the most interesting thing is where the information came from. There is no mention of the number of ribs in any of the academic tomes on horse evolution (e.g., G. G. Simpson, 1951; B. J. MacFadden, 1992). The main ‘culprit’ here appears to be Orohippus, as the number of ribs in the other horses noted in the quote are similar. Unlike many other fossil horses, including Eohippus/Hyracotherium, Orohippus is known from very little fossil material, and I am unaware of any documentation of a complete skeleton from a single individual. The clue appears to be in the wording: “One [proposed horse evolution sequence] displayed some years ago in the American Museum of Natural History”. I propose that whatever mounted specimen seen by the original progenitor of this story about ribs and lumbar vertebrae was poorly reconstructed from several individuals, and that the number of ribs and lumbar vertebrae was simply inaccurate. That being said, I have a photo of the mounted Orohippus in the current display of horse evolution at the AMNH (which was likely the same one used in the original, linear display that they had many years ago. It has 18 ribs and 6 lumbar vertebrae. A lot of YEC people do use the term microevolution, but with different assumptions about evolution and how it works. Darwin’s finches for example (or the horses you are talking about), can work in a creationist mindset even for those who reject the term microevolution as conceding too much ground to the evolutionist. As you mention, genetic variation in the DNA can account for different traits coming to the foreground. Consider the human race (the entirety of which Christians believe to be made in the image of God). A child can be born white in Africa or with blonde hair and blue eyes in India. Is this evolution? I would argue that is it not evolution in the way that evolution is popularly understood. It is not even necessarily “change” in the DNA. All we can really say is that it is “change” in the physical appearance of a family. DNA is incredibly complex and I remain very wary to say that evolution has all the answers. irrelevantmag, I am really trying to understand what you are saying, but I am puzzled. Are you saying that the difference in skin and hair colour between one individual and another is not (generally speaking; strange things very occasionally do happen during development) written into their DNA? One demonstration in Alice Roberts’ delightful BBC Christmas lectures last week (catch them on YouTube if you can) had her and her geneticist colleague look at the DNA of a person off-stage, and correctly infer exactly that about them. You “remain very wary to say that evolution has all the answers.” I don’t think any working scientist would claim to have “all the answers” about the cutting-edge questions in their field, but I do have to wonder whether you have any specific questions in mind, and whether they are questions (such as the origins of life, the universe, and everything) to which evolution doesn’t have the answers anyway. Thanks for the question for clarification, Paul! Im trying to say that the difference between hair and skin colour is the product of DNA but is not the product of evolution as it is popularly understood. What you mean by “change across species”? Do you deny the existence of the enormous number of intermediate forms (if I recall correctly, nineteen separate genera identified in the transition between land animals than modern whales)? Or do you regard the existence of these intermediate fossil forms, or the existence of phylogenetic trees based on DNA in that match the trees generated from the fossil record, or from anatomy, as not constituting good evidence? Of course, if by “change across species” you mean the formation of crockoducks, there is indeed no such evidence because no such thing happens. Your family tree tells you that you are descended from your grandparents and related to your cousins, Your parents are intermediate between you and your grandparents, but there is no intermediate between you and your cousins; why should there be? I am doing my best not to come over as adversarial. You must surely have thought of all the things I have mentioned, and I would really like to know your response. My basic thesis is what I mentioned above: “I’m trying to say that the difference between hair and skin colour is the product of DNA but is not the product of evolution.” I am aware that evolutionists don’t believe in the crocko-duck, but I am also aware that within evolutionary thinking there is always the possibility of a crocko-duck. Not from breeding, but it is possible that the duck starts too develop crocodile-like features. The chances are quite slim, but the chances are there (within evolutionary thinking). The question is: do you and I come from the same family tree (Adam & Eve) or do you maybe come from an ape and I come from a chimpanzee? Or do we both come from a chimpanzee? Is it possible that a chimpanzee in Africa is my cousin and we need to have a family reunion? Or is the entire animal kingdom far of relatives? I believe that we both come from Adam and Eve and that as such, I am called to respect you as a person made in the image of God rather than primordial ooze or something else that got the whole universe going. I’m not a scientist, and I have only had a bit of scientific training at various points (including natural history! ), so I am simply defending the creationist system as a rational system. At the same time, I do find these conversations helpful to further define my terms, to learn more about the world, and understand the diversity in the evolutionary view of the world. If a duck ever did begin to develop crocodile-like features (difficult, really, because it’s lost its teeth, and its wings are pretty useless as front legs), it would never actually become a crocodile. It would become a member of the family Anatidae within the class Aves that happened, bizarrely, to have become convergent on crocodiles in some fashion (as yet to be determined). That’s the difference between evolution (which is always limited by phylogenetic history) and transmogrification, which is what many creationists imagine evolution to be all about. BTW. Paul has been extremely polite: please don’t mock his approach. I think I am actually understanding that point more. And yet, what I do think I can argue is that within evolutionary hypothesis one thing can become something quite different. I do recognize that I am working with some stereotypes of evolutionary thinking though. Check out my other response to Dr. Braterman for some of the historical assumptions that influence my view of what is observable. Since you mention history, something which I have great reverence, let me point out that a great deal is known about the history of Genesis itself. Excellent books on the subject include Hayes, Introduction to the Bible, Finkelstein and Silberman, The Bible Unearthed, Friedman, Who wrote the Bible [actually, just the Pentateuch], and Finkel, The Ark before Noah. But it would help me greatly if you do answer by actual earlier questions. You agree that a difference in hair and skin colour corresponds to a genetic difference, as embodied in a difference in DNA. You also agree that Africans and Europeans share a common ancestry. (Incidentally, this means that all humans are at exactly the same distance from chimpanzees.) It follows that while the lines of descent that led to Africans and Europeans originally had the same genetic makeup, there is now a difference in genetic makeup between these two separate populations. Do you agree? The correct technical description of “evolution” is “change in genetic makeup in a population”. By this definition, the difference in skin colour is an example of evolution. Why do you have a problem with this? By the way, my opening comment above was intended to be an enjoyment of “creationist stereotypes”. That wasn’t intended to target your tone, since we are having a respectful conversation. I should hold off on the satire in a more “academic conversation” with a professor in science. Thanks for your explanation of your take on evolutionary thinking. It seems to be quite reasonable without holding to the extremes. Our fundamental difference is that I believe it is fully rational to work back and forth between science and the creation account of Genesis 1-3. I don’t think science can work in a vacuum and has to connect with history. In my mind we do have a history of origins and a God who created the world. I don’t believe that it is unscientific to say that God created Adam and Eve and He created them with DNA in which certain traits come to the foreground. In that sense of the word, God created the animal world and humans according to their “kinds” with all the genetic make-up which would be the basis for all the diversity we see today. Now, questions of contemporary observation come into play, and I am not discounting the hard work of scientists to work with what is observable. I just realize that my own integrity as a thinker has to grapple with the historical accounts of the Bible. I think that is where the biggest departure in “thought” would come from. No problem with the banter. But I am very disappointed that you have not answered my question. You may be concerned that evolution science could be used to support a claim that this or that group of humans are more or less evolved than others, or are more or less closely related to our ape cousins. Let me assure you once again that what evolution science teaches is the absolute opposite. All our genetic inheritance, including the traces of Neanderthal and other species, comes from a single interbreeding group that had been separated from its ape relatives for several million years. Don’t take my word for this; visit, for example, the Smithsonian website and examine the evidence for yourself. I still do not understand why you refuse to describe differences in skin colour among groups of people as an example of evolution, although you accept the common ancestry of these different groups. Please explain. It would help if you told me what you mean by the term “evolution”? I do not think that any of the topics we have hitherto discussed, other than the size of the ancestral population, are mentioned in Genesis, so I do not think that your mention of Genesis provides an answer to my questions. I would greatly appreciate an answer. I do have another question then: does the DNA evolve (change) or is there simply evolution (change) in appearance with no change to the basic genetic material? Changes in what is inherited do indeed correspond to changes in the DNA, which carries the genes. That is why the technical definition of evolution is a change in the genetic makeup of a population. A lot of evolution corresponds to changes in the frequencies of existing varieties of the genes that are already there, but additional novelty is provided by “mutation”, which simply means change in the DNA. Such changes are inevitable, because although the DNA copying apparatus is very good, copying is never perfect. So mutations are happening all the time. A lot of them don’t make any difference, so whether they spread or not is a matter of chance. Mutations that reduce fitness tend to be bred out, and those that increase fitness tend to spread. Fitness depends on circumstances, and may not always correspond to progress. For example, a mutation that stops eyes from developing will increase the fitness of cave fish, since it will save the effort of developing eyes where there is nothing to see anyway. The environment can affect how genes work, but the evidence at present suggests that it is unusual for an environmental influence to be inherited, and when it is, it disappears in two or three generations. Yes, this does help me to understand your perspective. My comments about a dog evolving into an elephant were really quite silly, although I am still not convinced that it could not happen in an evolutionary framework (with a very very very slight chance of probability). I was trying to aim though at this whole concept of evolution (change) within the DNA. I’ve had a couple conversations now with people who deny ‘change’ in that sense of the word all together. And they do seem to have a point when they talk about dominant traits and weaker traits and how certain conditions bring certain traits to the foreground (like me getting a sunburn when I walk out into the sunlight). I wouldn’t really think of sunburn as a change in my genetic makeup. I’ll have to bring some of your points up to my creationist friends to cross-test what you are saying with other academic hypotheses. My research of evolution and creationism is a bit slow since I am not a scientist, but I keep on plugging. Very glad to have been of help. Your example of suntan shows a couple of very interesting things. As you say, how your body changes in response to external stimulation is not an example of evolution. The inheritance of skin colour is actually quite a complicated thing. You have an inherited degree of colour that your skin would show if you were kept in the dark. And over and above that, you have an inherited propensity to generate more skin colour when stimulated by sunlight. When you tan in the sun, you are using a genetically determined ability already in place to respond to that stimulus. And the amount of time that you personally spend in the sun will not affect your children’s skin colour. So you are quite right. Your suntan is not an example of evolution. Now take a group of humans, and let them live and reproduce under conditions of very low sunlight. Mutations leading to paler skin colour will be favoured, because of the way our bodies manufacture vitamin D. After a while (and I have read that a while is thought to be as little as ten thousand years; Christine and NH know more about this than I do) the population will have evolved paler skin. Move them back to areas of high sunlight, wait long enough, and they will evolve towards darker skin. It is worth repeating that the paler and the darker groups are equally evolved, although they have evolved in different directions regarding skin colour in response to different situations. Notice also that the selection pressures would be very much weaker for us than for our ancestors, since we go around fully clothed and are less likely to have vitamin-deficient diets. I do have another question. On that note, I am not implying that you are racist in any way. I recognize that most evolutionists are not racist. Again, I just see a possibility for racism within the evolutionary framework, since no evolutionist is able to chart out the history of mankind and the changes that have taken place in the DNA over history. I understand your concern. But againt may I assure you that the amount of variation among humans now, despite the fact that some populations had been separated for tens of thousands of years, is nowhere near large enough to prevent successful interbreeding. Thus there is absolutely no scientific basis for objecting to interracial marriage. Moreover, the genetic variation associated with skin colour, despite all the cultural baggage that skin colour carries, is a tiny fraction of the variation encountered within any population and to which we never give a moment’s thought. You will no doubt meet racists who pretend that their racism has a scientific basis. I hope that now you will be in a better position to answer them. And I really appreciate your questions, which have helped me clarify my own thinking and expression. The characteristics of the DNA molecules are quite stable. It’s not that the double helix can’t change but stabalizing selection is a strong force that selects against any modifications of the primary structure of DNA. But the marvel of DNA is that through the parts remain the same, which provides remarkable stability, the parts are interchangeable making the use of the molecular highly pliable.. I would note that viruses have managed to use a wide variety of nucleic acids that go beyond the typical double helix DNA so even that structure isn’t universal. I might add, that it’s important to realize that something that “evolved” in the past really don’t evolve anymore. The basic form of DNA might fit that mold. It could be there were many forms of nucleic acids and different genetic codes at one time but once one worked well swept to fixation and after that no organisms can afford to fool around with that basic coding and so change really can’t happen anymore. Another example is photosynthesis. There is word today that scientists have greatly enhanced the efficiency of photosynthesis. Well, why haven’t plants figured this out if evolution leads to better solutions? The answer is that the original process of photsynthesis evolved when there was barely any oxygen and so that mechanisms didn’t have to deal with oxygen stress on the system. Once oxygen increased in concentration the particular pathways for doing photosynthesis were already in place an complicated enough that no organisms could rearrange all their parts to do it a better way to avoid the oxygen contamination. In other words they do the best they can with the system they have but we are able to see ways to remake the process so that it works in a high oxygen environment and so make a far more efficient process than nature has been able to make. These are examples of what we call historical contingency. Another example more familiar would be to ask why do we all use the same type of electrical outlets in America. Is it the best one? Not necessarily but way back when there were several types of outlets but so everyone could use the items better they converged on one type. Now we have billions of outlets that are all the same. I could say, hey there is a better outlet and I’m going to make a product that only used my special outlet. I’d probably go out of business. Its really hard to get everyone to change to something new. That is the same as organisms, they can’t just change the way they code a protein even if there is a better way of doing it, There has to be a pathway on in which they can make the change and have enough fitness why they are making the change for them to survive. @ Natural Historian: Of course the classic example of this sort of thing (historical contingency) in the world of human-made objects is the QWERTY typewriter keyboard. Originally invented to slow down typists so that they didn’t get the keys jammed together. There are other keyboards that are much more “efficient”, but as the QWERTY one has such a historical legacy (and it’s certainly ‘good enough’) none other has taken over from it. That’s funny I was going to use QWERTY and thought that with so many people texting and not using keyboards as much ( I have students that do term papers on their phones!!) that it might be time to try another example but I forgot that even on the cell phone that is still QWERTY even though it makes no sense for using just a few fingers. Re the notion of a dog evolving into an elephant. You say that it might happen with ‘a very very very slight chance of probability’. Actually, there is zero probability. No modern day animal can evolve into any other. The genetic lineages leading to dog on the one hand, and elephant on the other, have been separated for over 60 million years. Perhaps the question might be phrased as: could a dog, over time, evolved into an animal that looked like an elephant (but would, of course, still carry all of the genetic lineage of being a member of the family Canidae, Order Carnivora, etc.)? Not impossible, but pretty unlikely. A dog is already very specialized in its feet and its teeth, it is improbable that those features could be reversed to result in a 3 ton, short-footed herbivore with teeth suitable for grinding up coarse vegetation.. But perhaps a less specialized relative of a dog, such as a raccoon, could evolve into such an animal. The issue then becomes: what would be the evolutionary selective pressure for this to occur, with the niches for big herbivores already occupied? When the lineages of mammals that are around today first started to diverge and radiate, it was following the extinction of the dinosaurs, and the devastation of the earth by a collision with an asteroid (or other large extra-terrestrial body). After the world recovered, a million years or so later, there were no large land animals, and so plenty of vacant niches for the lineages of small critters that survived the impact to evolve into. So, if a raccoon were to evolve into an elephant-like animal, there would have to be a similar event clearing the earth of all large herbivores. Even then, it would take many million years (10 at least) for such a change to be effected. godd points about what a horse is. this yEC suspects the KIND on the ark only included what we now call horses. first because the horse is a creature for running to defend itself. Its unlikely such creature existed before the flood. instead ir would have a different bodyplan. YES YEC is rightly being more inclusive in what is within KINDS and what is not kinds. what YEC thinkers said in the old days doesn’t matter. jUst Genesis. thats our point. I wopuld include by the way litopterns “horses” These are creatures , some, which are identical to horses but denied by evolutionists to be horses. instead threy invoke convergent evolution to explain the likeness in bodyplan. Yet they were just horses in s America with some changes. the horse is another great case for creationists because as more fossils are found it blows away the simplistic original THIS to THAT horse series evolutionists first came up with. obviously it doesn’t matter about size or claws/hoofs etc. creationists can/do/will ride this critter to a intellectual better finish line. Litopterns are tackled in my article. I read your article. I found only a tiny reference to litoptern horses. Indeed your whole article just documents a diversity of horse types with a claim that they are separated by timelines based on geology. In fact they all lived at the same time and the diversity is trivial. Anyways the litioptern horse was so alike to our horses they invoke convergent evolution. they have to. yet there is no reason to say its not a horse except a classification system based on evolutionism. The raw facts just show a horse, of coarse. And the orginal error of straight lines in evolution of the horse was destroyed by better investigation. they retreated to a bush lineage to save themselves but it just made it worst. you can say anything by saying grouping traits on minor details but ignore the great morphological details of what a horse looks like. I think even this is a post flood adaptation even however. your article just documents everything is basded on comparative anatomy. There is no biological evidence they evolved from each other of from anything. by selection on mutations I mean. A creationist can predict more fossils will just make it more bushy until its meaningless. A litoptern horse is just a horse and its grouping with unrelated creatures into a litoptern group is the same rror as grouping marsupials together despite having diversity in bodyplans mimicking creatures elsewhere. I gave as much room to litopterns as they deserved in an article about horses. They’re often used by creationists to try to argue that evolution went ‘the other way’, i.e., from one toe to three. This makes about as much sense as the claim that one-toed horses (family Equidae) gave rise to three-toed rhinos (family Rhinocerotidae) (because the examples picked by creationists are from different families). Litopterns are an order of mammals, the same rank as the order Perissodactyla (which today contains families of horses, rhinos, and tapirs), and they comprised many families. Many litopterns looked more like camels than horses (but with three toes rather than two). One family (out of 6), the Proterotheriidae, contained a couple of sheep-sized genera (Diadiaphorus and Thoatherium) that were a bit horse-like in that they had legs with only a single toe. However, unlike any single-toed horse, they had short necks, short faces, and their teeth were low-crowned with an occlusal pattern unlike that of any horse. So, not really like horses at all. There will always be ‘straight lines’ in horse evolution if you trace back any given taxon to its origins. Just as most Europeans can trace their ancestry to Charlemagne. Doesn’t mean that there isn’t some bushy branching of the family tree between you and Charlemagne, however. I question we all go back to charlemagne but I know they try to say things like this. I know creationists might pick up on the toe details but i make a bigger claim. The litoptern “family” that looks like horses are horses. the others are camels etc etc. they are just these creatures that adapted upon migration into S america some like traits forr good reasons. they do invoke convergent evolution for the horse ‘litoptern” and I think one species has the horse name in its title. Teeth are irrelevant as compared to the general bodyplan. You have great faith in the classification system made up long ago by a few dudes. You are making the error of using/thinking the classification system is evidence for evolutions claims. Even if it was a true classification system it would not be evidence. Its not true. they group things on traits and get it wrong. the litoptern horse is shown in pictures as a horse. in fact evolutionists use it to show how real horses legs evolution were mimicked by a unrelated creature. In other words evidence for convergent evolution. Yet it comes down , in this example, as to why is a litoptern horse not a horse?! It has a horse head, horse, body, horse legs and toes. Its a horse , of coarse, of coarse. its not some fantastic litoptern order .